A 7.9 magnitude earthquake hit the central coast of Peru on August 15, 2007, killing 519 people and injuring 1,366. Ambassadors for Peace in Peru were very busy in December 2007, taking the opportunity of this season of goodwill to visit some of the most deprived areas of Peru to bring them support and hope for the future. One group, led by the National President of UPF-Peru Rev. Dr. Orestes Sanchez, traveled to Chincha, a small town about a four-hour drive south of the capital, Lima, that was seriously affected by an earthquake in August. Many people are still without jobs or homes, following the devastation that saw the main church of the town collapse, killing many people who were inside at the time. The Ambassadors for Peace worked together with the National Police Force, doctors, psychologists, and volunteers, bringing food, medicine, free primary health care consultations, advice on creating small business enterprises, and the traditional Christmas "chocolatada" event that involves giving children hot chocolate and panetones (Christmas cake). The many children of these poor people also received some guidance from skilled pediatricians. Free haircuts were provided, something very basic that is always appreciated. The director of the Mothers' Clubs in Peru, Sra. Rosa Castillo, who is also Vice President of UPF-Peru, coordinated this event. This was her second visit to the town since the disaster. On her first visit she mobilized people in Lima to donate clothing for those in the disaster area and then mobilized a convoy of trucks to deliver them. 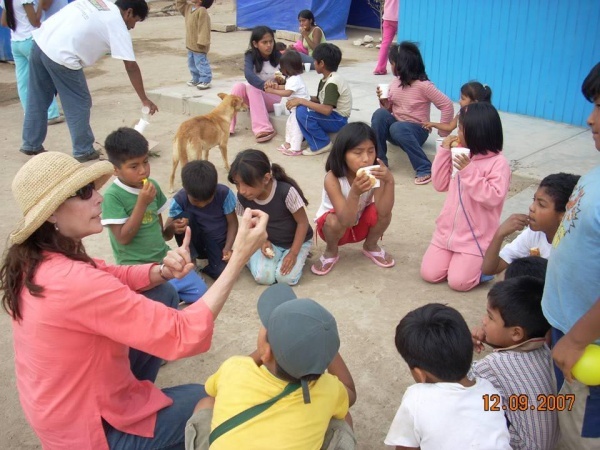 UPF and its associated organizations have been working with the poor of Peru for many years, providing equipment for communal kitchens where parents join together to produce at least one good hot meal a day for their families. There are now over 100 such kitchens in Lima and some of the provincial towns sponsored by donations from Japan.